Reissue of the overlooked indie classic by pop oddballs Eric Matthews and Richard Davies. The duo Cardinal formed in 1993, released an EP and a self-titled full-length that was a kaleidoscope of strange pop hues, and were not heard from again for the rest of the decade. They finally resurfaced in 2012 with a second album, Hymns. Such a history is unremarkable in the world of indie music, but as more facts come to the fore, so does artistic integrity. Richard Davies, formerly of another weirdo pop band, the Moles, later toured with the Flaming Lips as his backing band, and, as a solo artist, released the excellent There’s Never Been a Crowd Like This in 1996. Eric Matthews, Cardinal’s other half, went on to have a successful solo career, releasing albums on Sub Pop and Empyrean, and collaborating with the likes of Jason Falkner and Lou Barlow. His latest project, Seinking Ships, even had a song featured on the ABC series Private Practice. Cardinal was produced by Tony Lash, then of Heatmiser and today a respected producer and composer in his own right. None of these facts are exactly ground-breaking, but they do further legitimize Fire Records’ move to reissue Cardinal a bit more. Seeing as the album was originally released in the midst of the grunge era, this age of anything goes may even be a little more accepting of it. Cardinal begins with an air of pomp, the chamber pop strings and trumpet of “If You Believe in Christmas Trees” raising a dainty hand in opposition to 1994’s primary trends. Such against the grain numbers is where the album most succeeds. 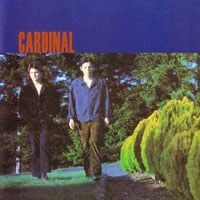 Yet, Cardinal is not without its own interpretations of some of mid ‘90s alt rock’s key traits. “Last Poems” is very of the era, but melodically strong enough to overcome the clichés of the alt rock genre. “Dream Figure” is not so lucky, even giving in to the era’s tendency of requesting some form of harm (here it’s “come and crack my head”), but the rest of the album is strong enough to resist one mediocre song’s attempt to adhere it to a particular time and place. “Big Mink” reaches a nice middle ground, reconciling the album’s chamber pop majesty with a more modest indie rock sensibility. Cardinal is bookended by two brilliant songs, the aforementioned “If You Believe in Christmas Trees” and “Silver Machines”, a soulful, slightly art rockish number with the indelible lines, “The music machine is a whore you can have a million times / Dependably, it makes you move too fast or slow.” The Cardinal reissue rounds the original album out with a handful of bonuses and demo takes, such as the whimsical instrumental “Forest Theme” (Cardinal itself features the charming instrumental “Public Melody No. 1” as something of an intermission) and the b-side “Say the Words Impossible” in both its demoed and finished states; the two versions are drastically different. Cardinal has, in some circles, been called the grunge era’s answer to Pet Sounds, and, although it has not been as widely cited as the Beach Boys’ classic, it has undoubtedly influenced more off balance indie popsters than one may expect. Here’s hoping the reissue will inspire another round.